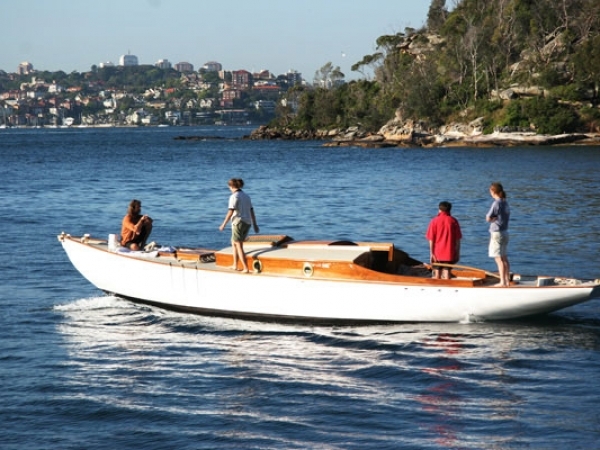 WINDWARD is a classic Gaff Cutter built in the 1920’s. 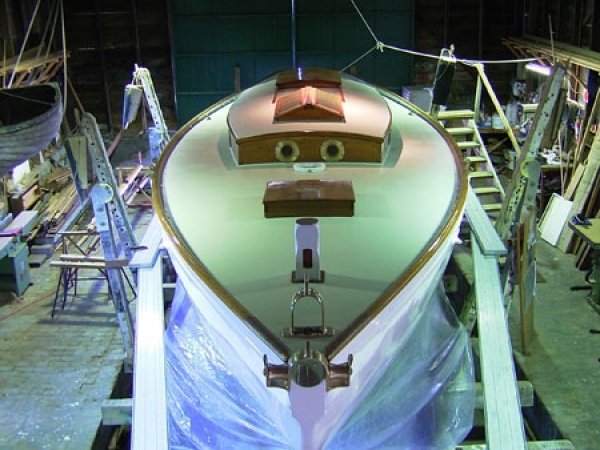 She is an unusual design, being a centreboarder with a spoon bow and counter stern. 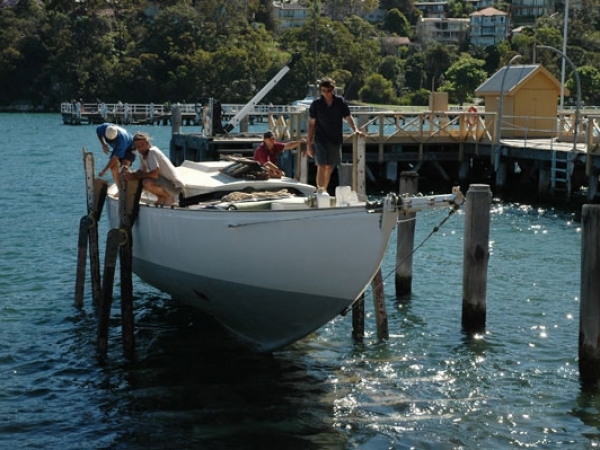 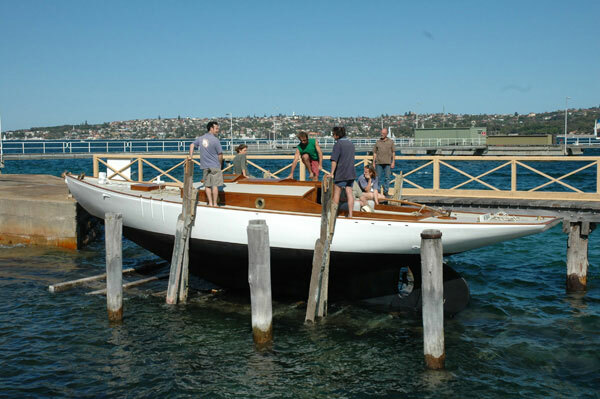 Her designer Bill Pickering was a well known Sydney amateur yacht designer. 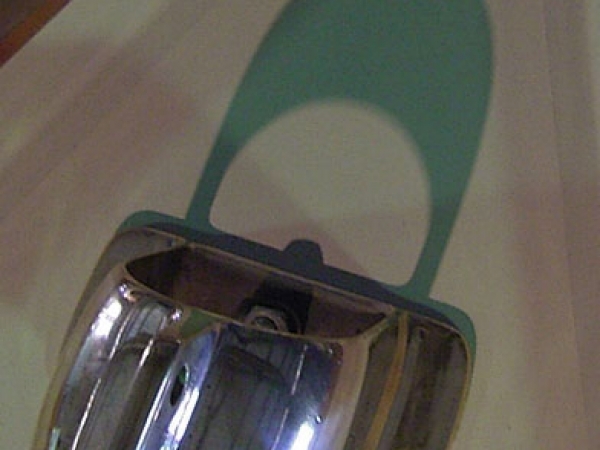 Her shape shows a marked American influence. 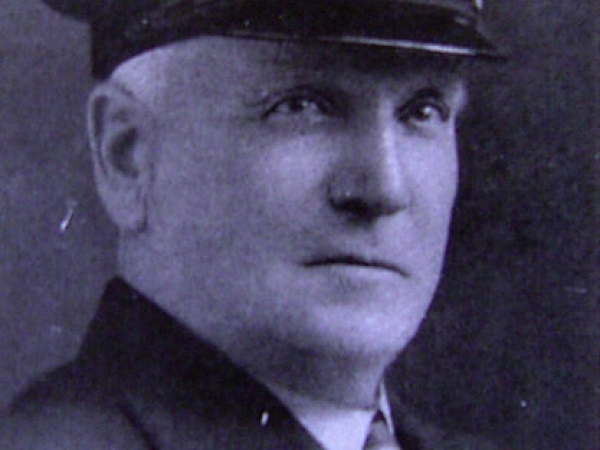 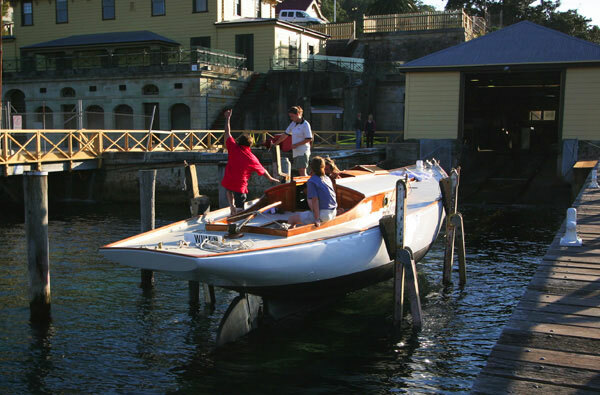 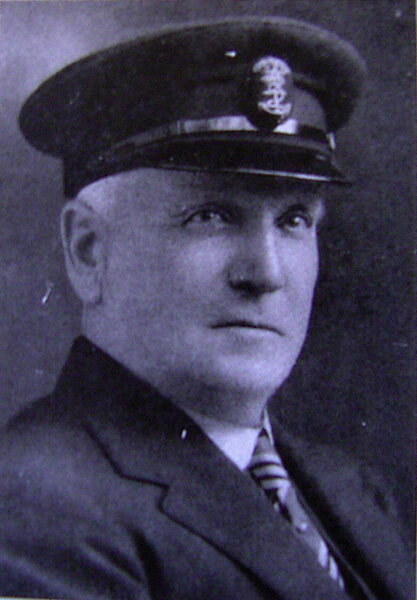 WINDWARD was built for Arthur Muston, the Commodore of the Edwards Yacht Club. 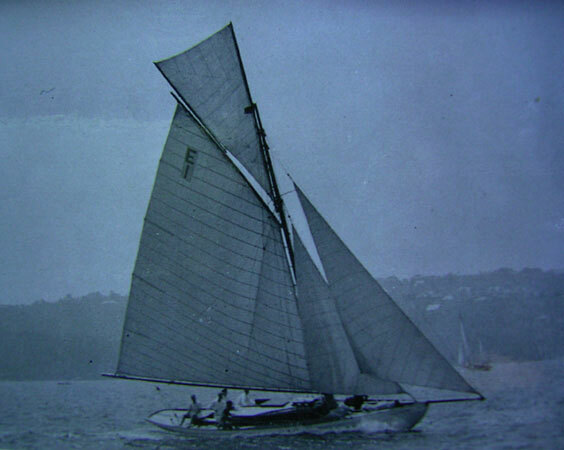 WINDWARD carried the sail number E1. WINDWARD was purchased by John Firth-Smith in 2003. 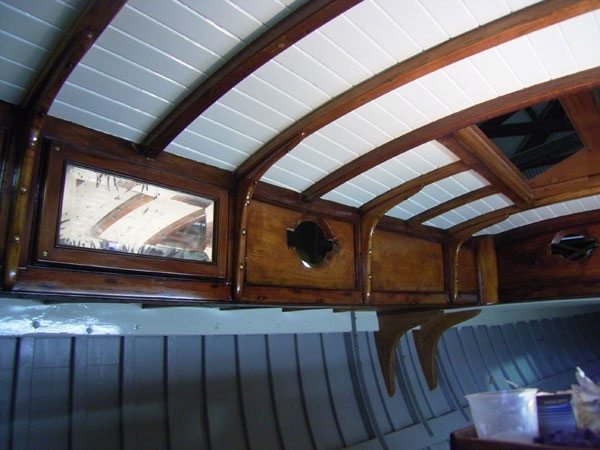 The hull was still quite original, retaining her copper sheathed centreboard and beautifully built coach house. 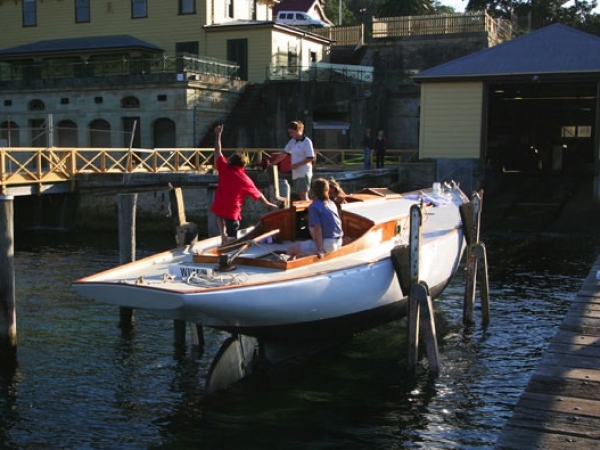 WINDWARD had been converted into a yawl for cruising. 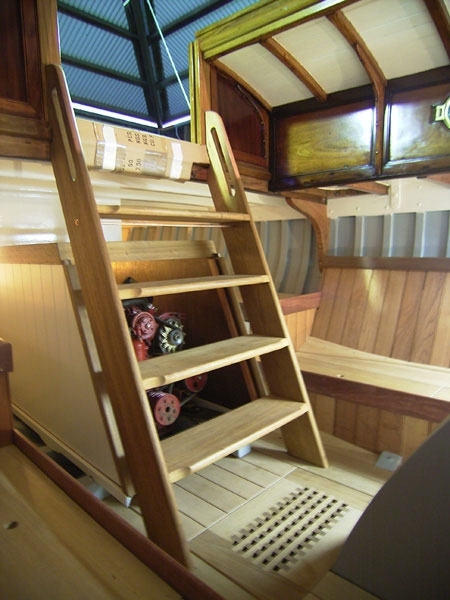 Much of her classical beauty was hidden under layers of added on cruising hamper. 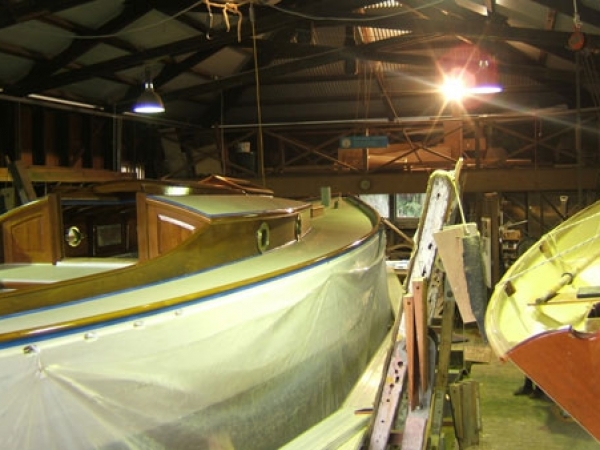 SWB were engaged to reinstate many of WINDWARD’S missing original features. 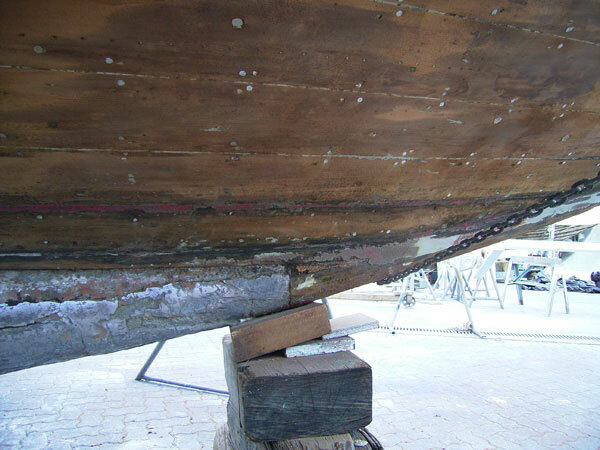 Structurally the bulk of the hull was sound, but she was leaking badly under the mast step. 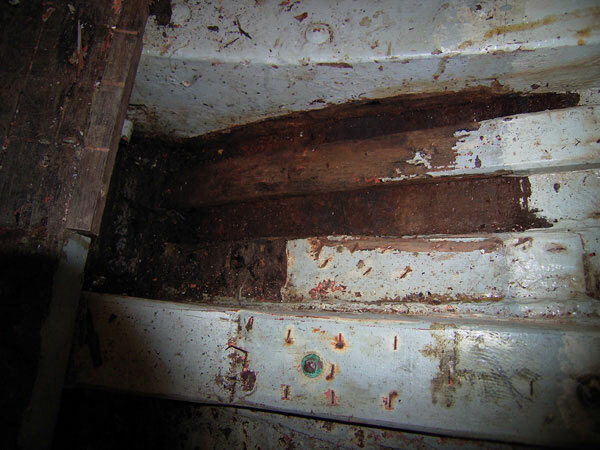 Many layers of poorly installed repairs covered the original framing in this area. 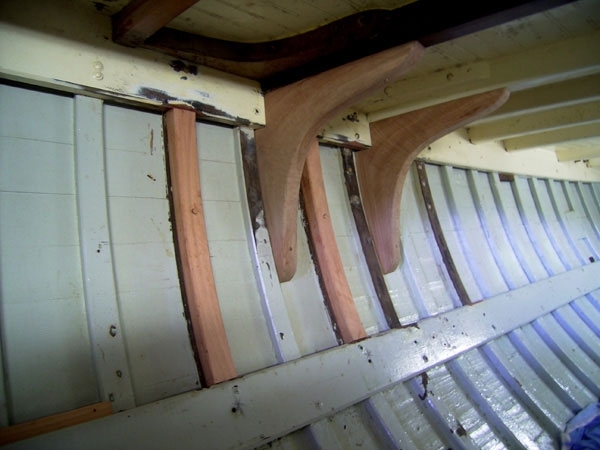 Layers of hardwood had been epoxy glued and stapled into the hull. 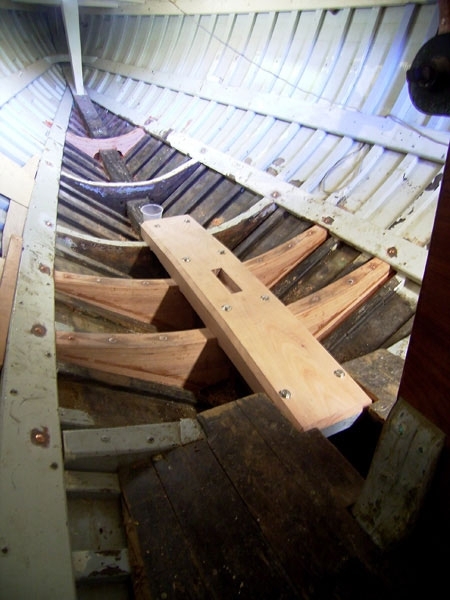 The staples were all stainless steel, but were leeching rust into the surrounding planking. 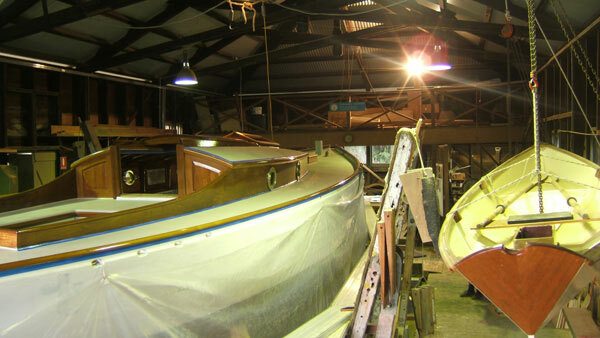 The original spotted gum frames were completely encapsulated and it was not possible to determine their condition. 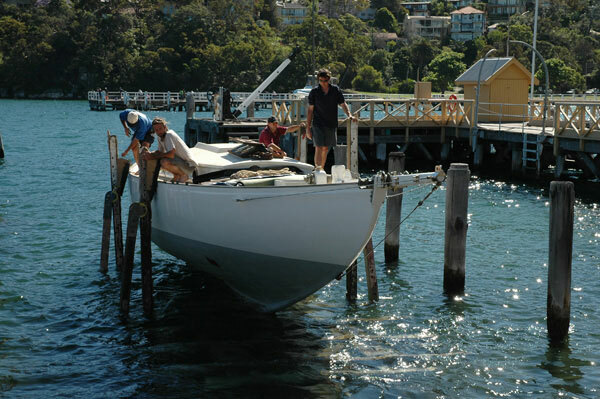 This damage had all started from the bobstay plate being damaged, worm had then affected the stem all the way down to the mast step. 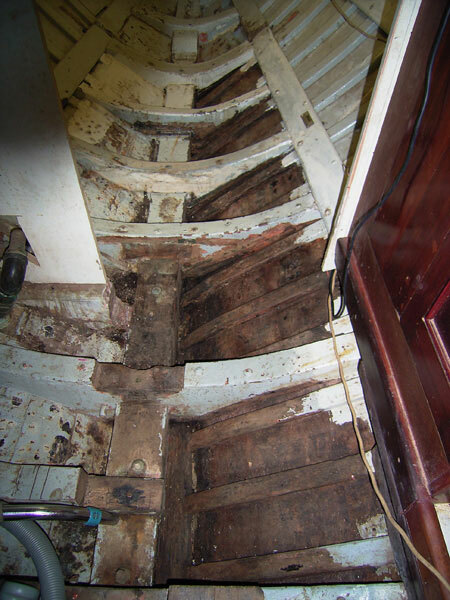 All the old repairs were removed. 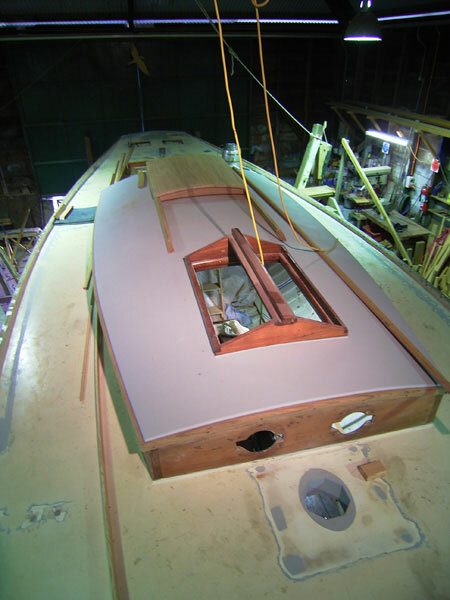 The stem was repaired structurally, and a new bobstay plate in Aluminium Bronze was cast and installed. 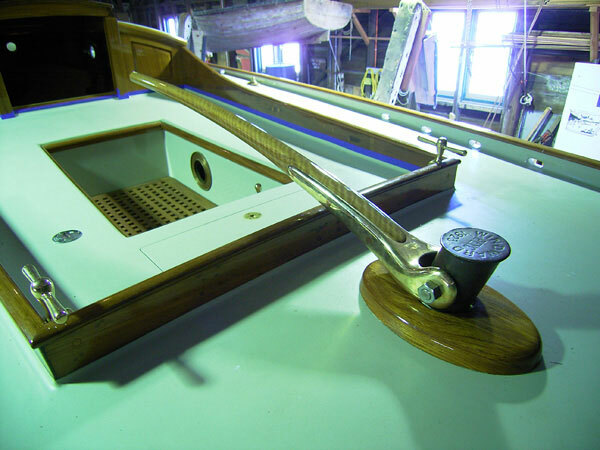 This new bobstay plate was extra long to strap the joint in the stem – the source of all the original leaks. 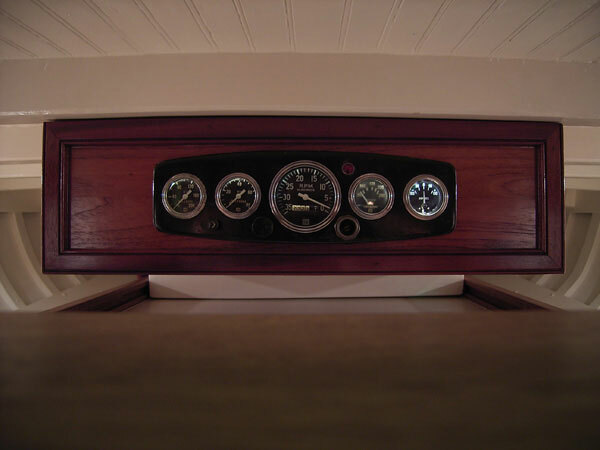 New tea tree floors were installed under the mast step. The mast loaded up a single floor timber. 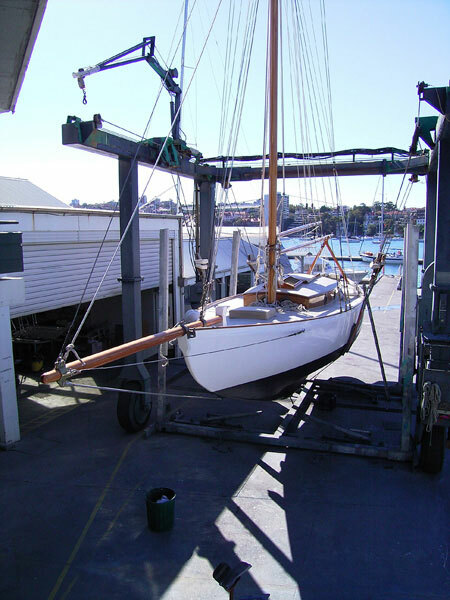 This was removed and the new floors were positioned so that the compression load from the mast was immediately spread over two floors. 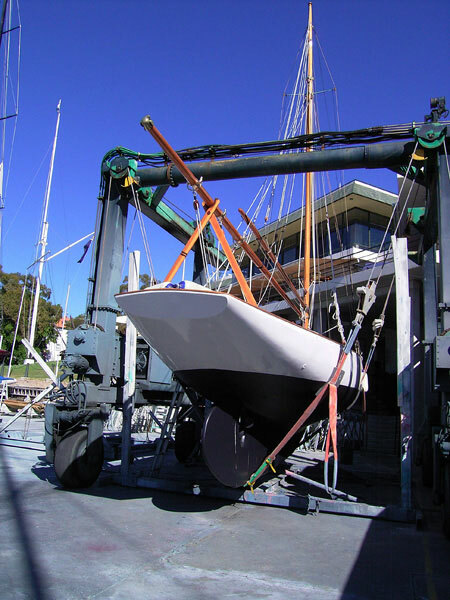 A more substantial mast step was installed over 4 x floors. 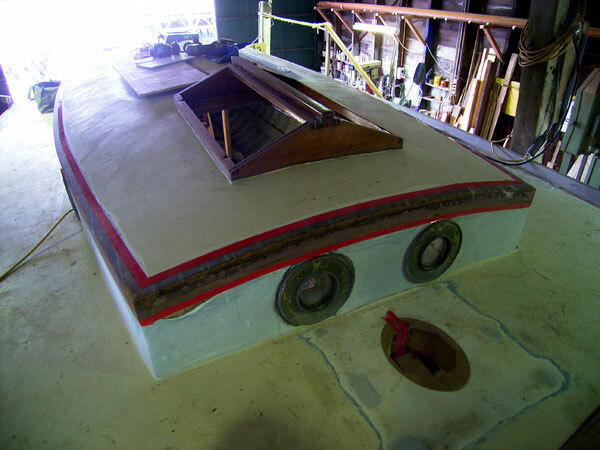 The hull was strengthened locally where rig attachment points landed on the hull. 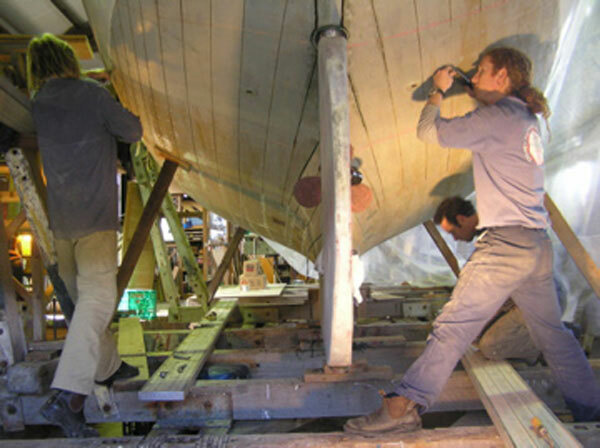 Hanging knees were added at the main beam ends on the mast partners and at the ends of the cabin where the running backstays attach. 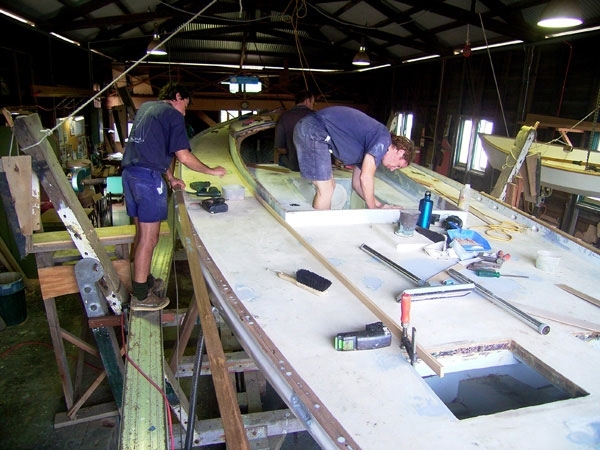 The frames, which carried the load of the main shrouds had flooded gum stiffeners glued to their inner faces. 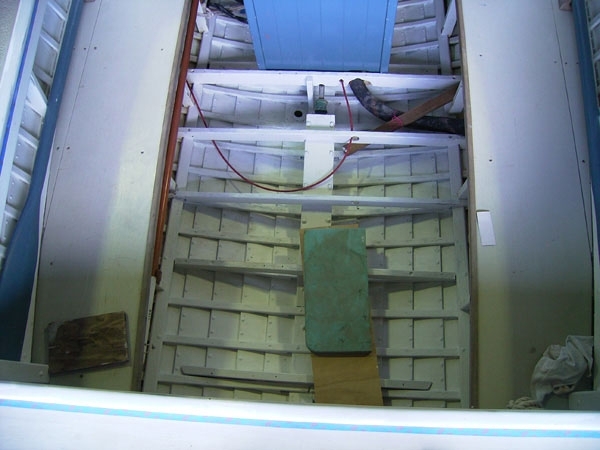 This enabled internal bronze straps to be through bolted through the external chainplates and carried down to the upper bilge stringer. 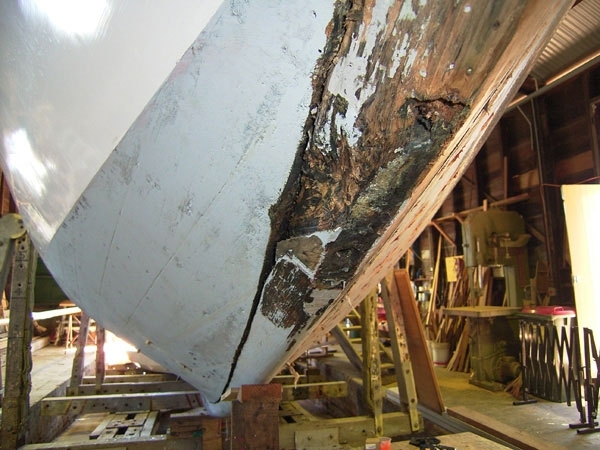 This immediately spreads rig loads through much more of the hull structure. 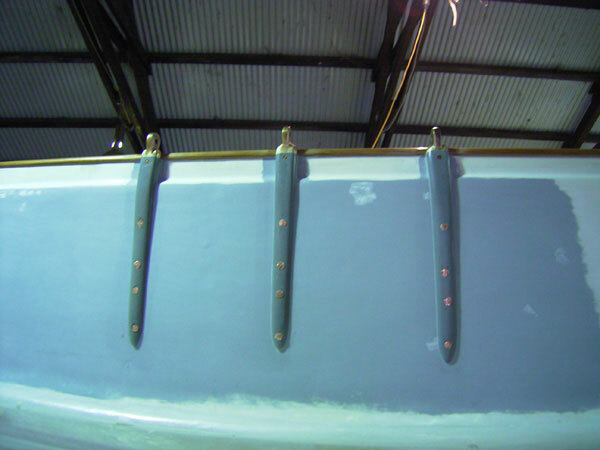 All the rig attachment plates were recast in Aluminium Bronze and copper bolted to the hull. 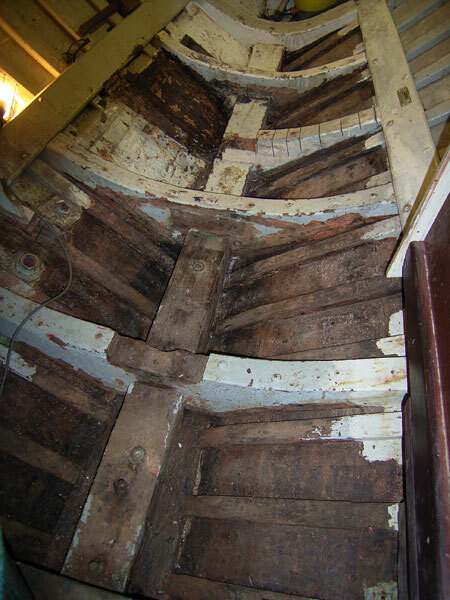 Once all the old repairs were removed the original structure was allowed to dry out slowly. 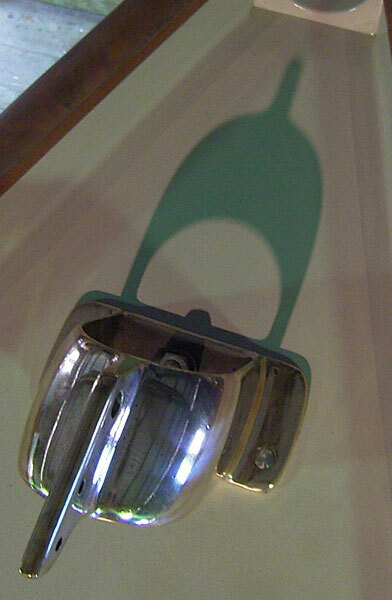 It was all sound. 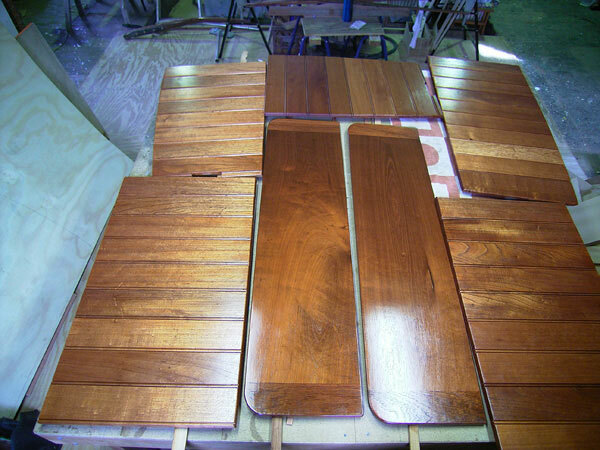 Several of the spotted gum frames needed new ends scarphed onto them. 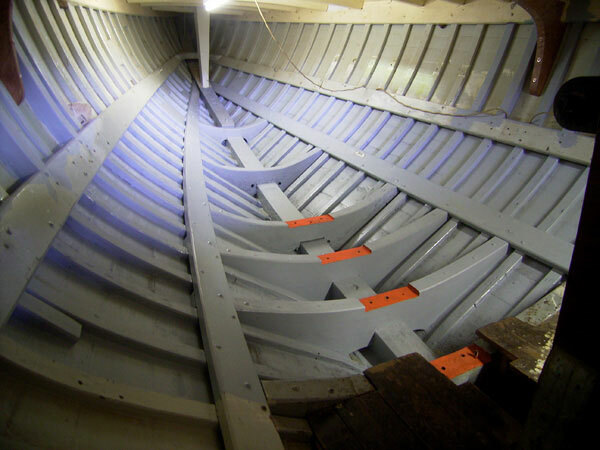 Once repaired the entire inside of the hull was scraped and sanded and repainted. 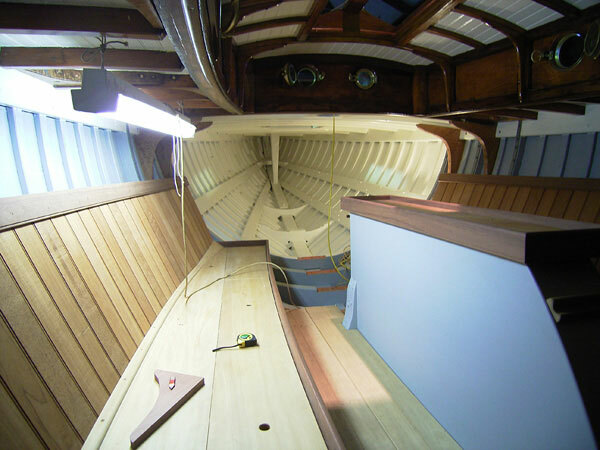 A new beech sole and new Red Cedar, Jarrah and Kauri fitout was designed and installed. 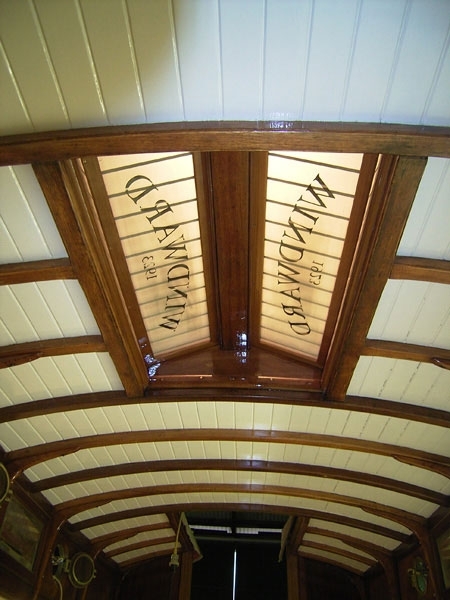 John Firth-Smith was involved in all detailing of the interiors and external trim.  He sent a constant stream of drawings to our fax machine! 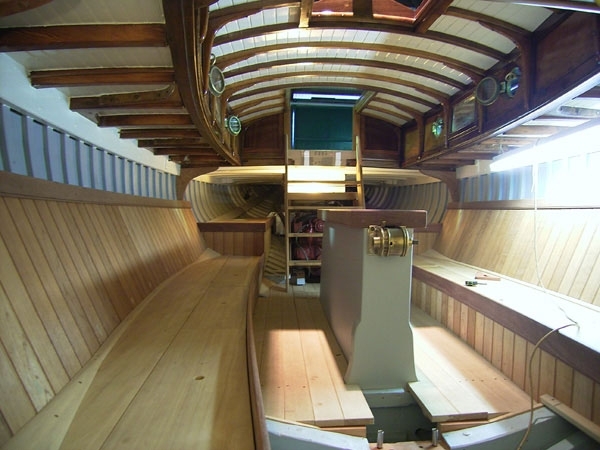 WINDWARD has a simple day sailing interior. 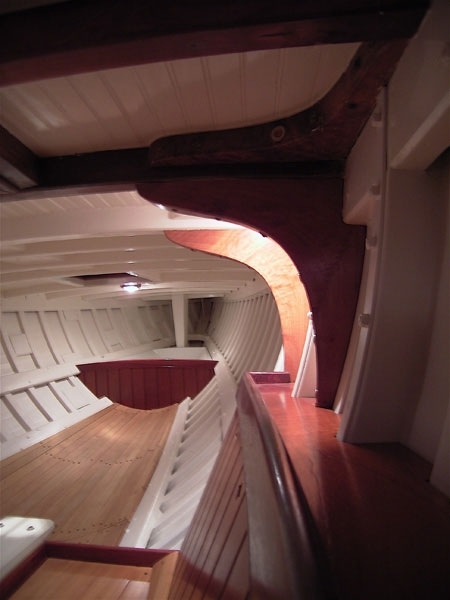 The interior was designed to show off her beautiful lines. 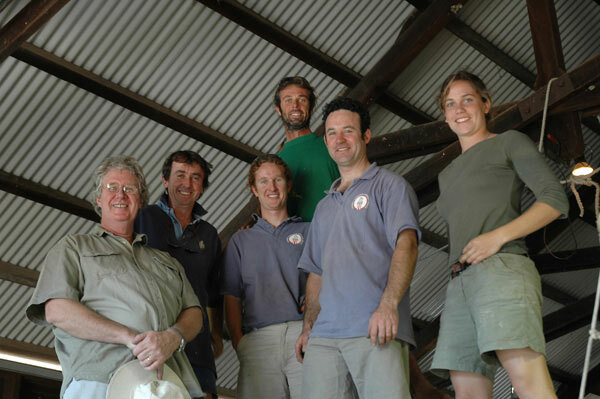 The original coach house was carefully restored. 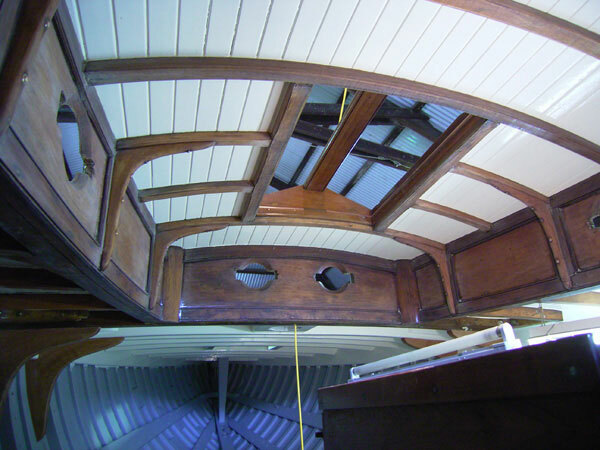 Many of the missing original teak mouldings and details such as the companionway hatch were copied from HOANA, which has a totally original and intact cabin built by J.HAYES and Sons at the same time as WINDWARD. 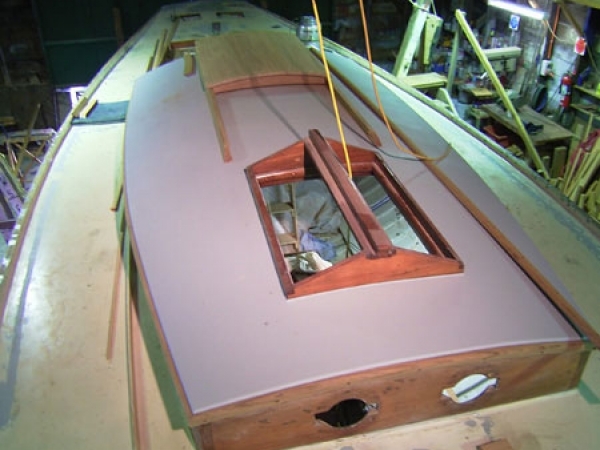 The Burmese Teak cabin sides had been sheathed in fibreglass, which had preserved them, but they had been previously damaged with a grinder when removing some of the old cleats. 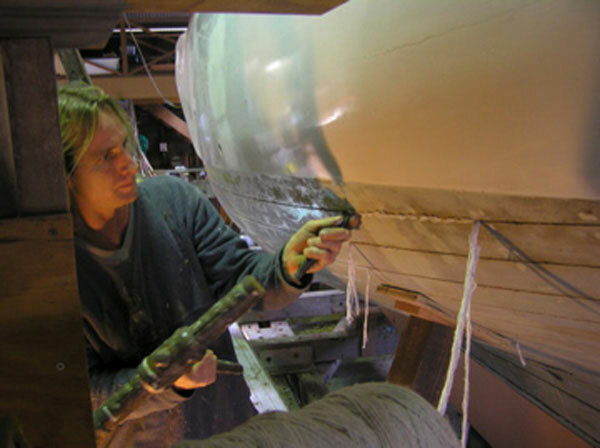 These areas were carefully dished out and clear resin filled with a uv stable resin. 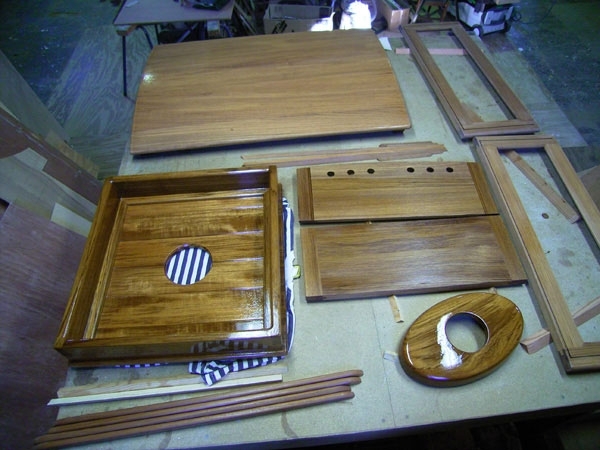 The cabin was then revarnished. 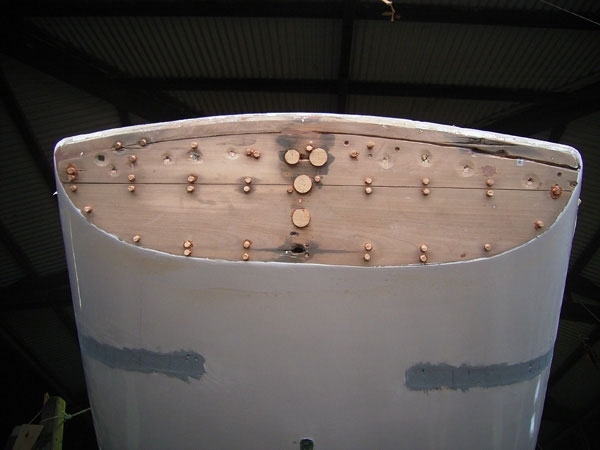 The toerails were faired up to remove humps in the sheer where the rigging tension had pulled the hull. 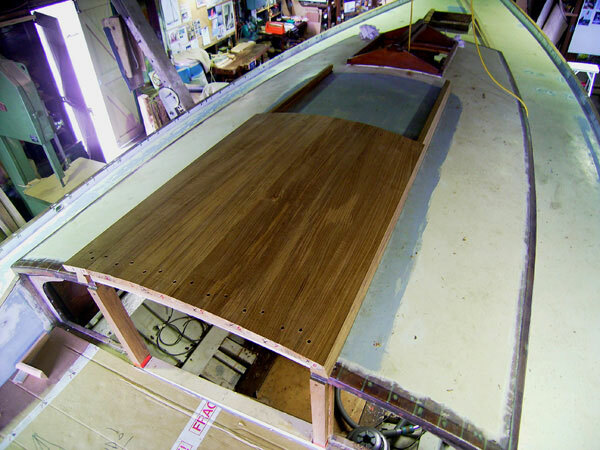 New teak caps were scarphed and installed. Ian Smith of Woodcraft Boats crafted a beautiful new set of Oregon Spars for WINDWARD and this was nicely complemented by well detailed standing and running rigging made by Joe Henderson of Henderson Rigging. 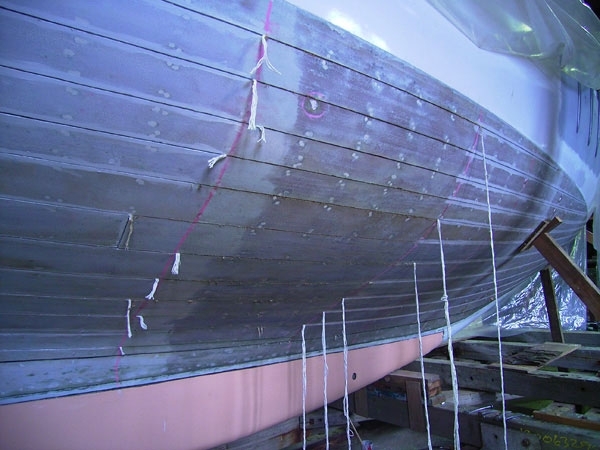 Externally the hull seams were raked underwater and fully recaulked and reputtied. 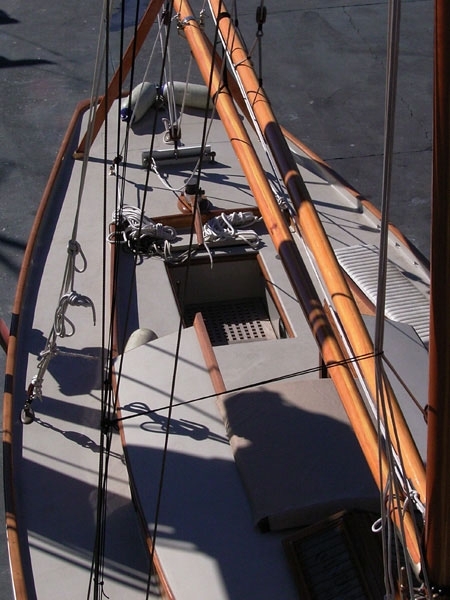 WINDWARD had been refastened with Monel screws in the 1960’s. These were in perfect condition, but the heads were all set flush with the planking. 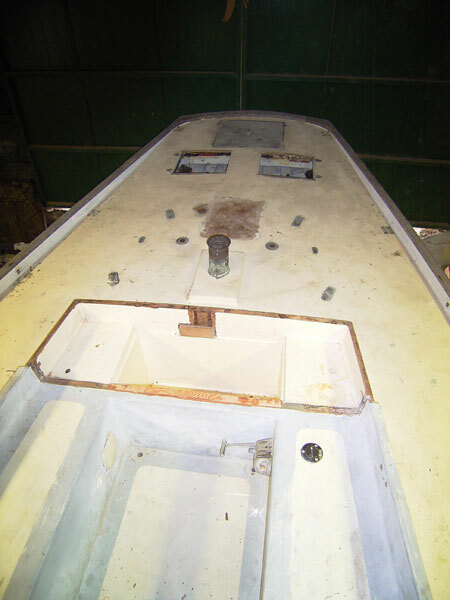 All the underwater screws were removed, countersunk and set in below flush, so the heads could be epoxy filled. 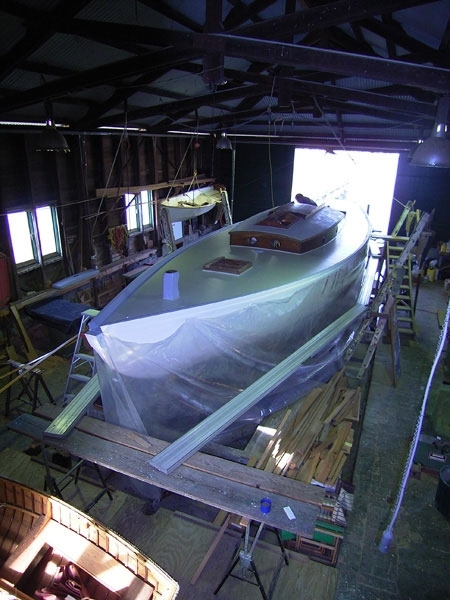 The hull was then sanded and primed and refinished. 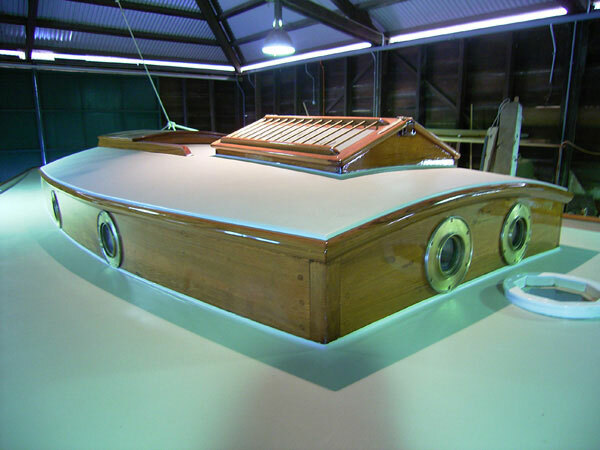 The final job of the hull restoration was to replace the copper lining in the centreboard case. 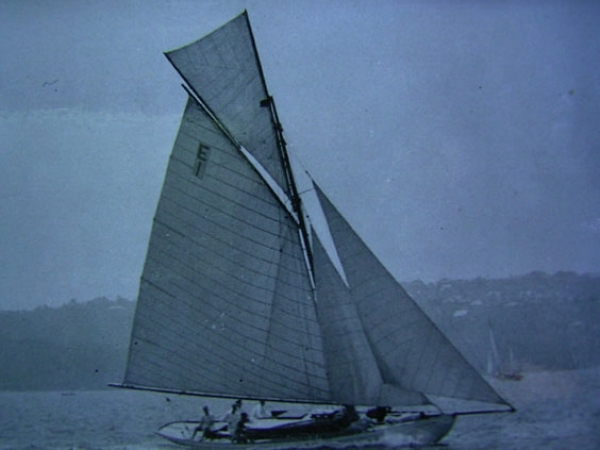 The original sheath had lasted 83 years! 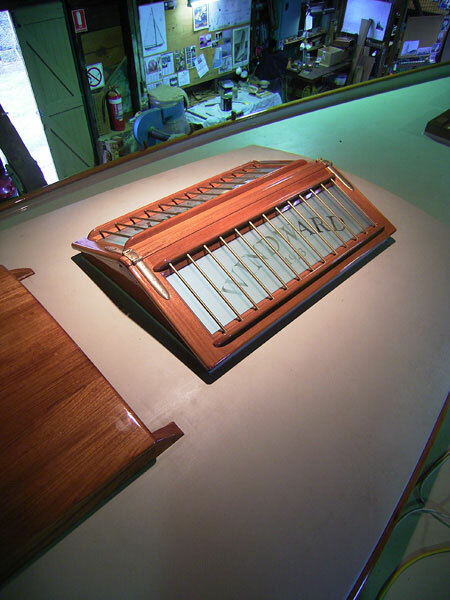 It was folded up and slid into place. 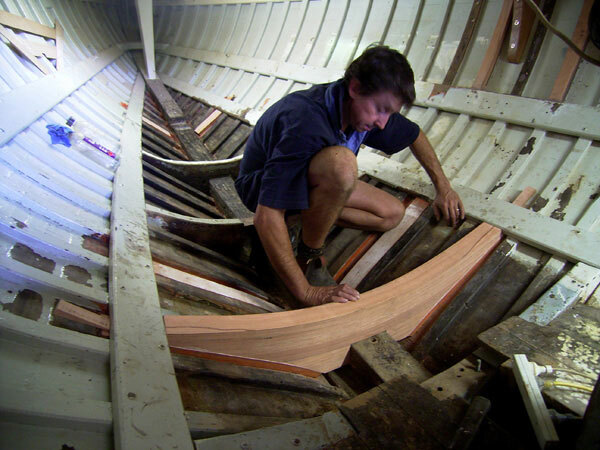 The original copper sheathed timber centreboard was sound and reused. With her original rig reinstated, WINDWARD is a period Gaff cutter once again. 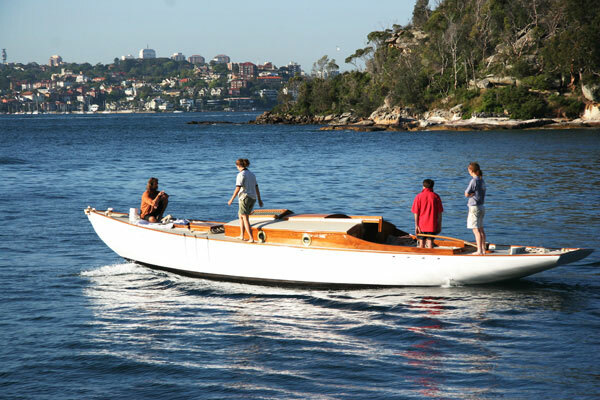 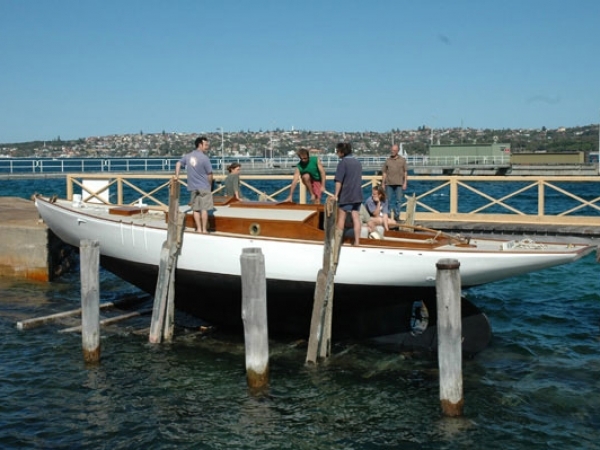 She is a beautiful example of a classic racing yacht that has graced Sydney Harbour for 91 sailing seasons.